WeatherBreaker canopies are compatible with both electric wheelchairs and mobility scooters. 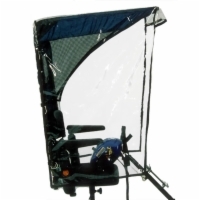 These canopies are great for people who regularly use their mobility aids outdoors and require protection from harsh winds, hot sunlight, and drenching rainfall. Choose a standard canopy for basic protection, or select a set with vented sides or removable drapes to enjoy a comfortable crossbreeze during your travels. 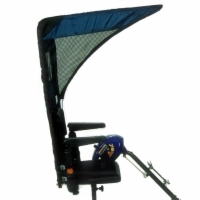 The Base Model is made of solid fabric and is less expensive. The Canopy fits any Wheelchair or Scooter. The Vented Model has mesh sides and a back mesh window (with removable cover) for extra ventilation and visibility. The Canopy fits any Wheelchair or Scooter. 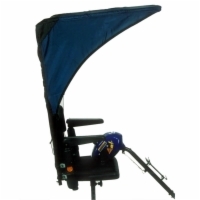 The Max Protection Model has plastic drapes that cover your sides from Canopy top to seat bottom. The plastic drapes fit over the top of the Canopy. The Canopy fits any Wheelchair or Scooter.